Diogenes of Sinope was a controversial figure. His father minted coins for a living, and when Diogenes took to debasement of currency, he was banished from Sinope. After being exiled, he moved to Athens to debunk cultural conventions. Diogenes modelled himself on the example of Heracles. He believed that virtue was better revealed in action than in theory. He used hissimple lifestyle and behaviour to criticise the social values and institutions of what he saw as a corrupt society. He declared himself acosmopolitan. There are many tales about him dogging Antisthenes‘ footsteps and becoming his “faithful hound”. Diogenes made a virtue of poverty. He begged for a living and slept in a large ceramic jar in the marketplace. He became notorious for his philosophical stunts such as carrying a lamp in the daytime, claiming to be looking for an honest man. He embarrassed Plato, disputed his interpretation of Socrates and sabotaged his lectures. Diogenes was also responsible for publicly mocking Alexander the Great. Diogenes was born in the Greek colony of Sinope on the south coast of the Black Sea, in either 412 BC or 404 BC. Nothing is known about his early life except that his father Hicesias was a banker. It seems likely that Diogenes was also enrolled into the banking business aiding his father. At some point (the exact date is unknown), Hicesias and Diogenes became embroiled in a scandal involving the adulteration or debasement of the currency, and Diogenes got exiled from the city, lost his citizenship, and all his material possessions. This aspect of the story seems to be corroborated by archaeology: large numbers of defaced coins (smashed with a large chisel stamp) have been discovered at Sinope dating from the middle of the 4th century BC, and other coins of the time bear the name of Hicesias as the official who minted them. During this time there was a lot of counterfeit money circulating in Sinope. The coins were deliberately defaced in order to render them worthless as legal tender. ; Sinope was being disputed between pro-Persian and pro-Greek factions in the 4th century, and there may have been political rather than financial motives behind the act. According to one story, Diogenes went to the Oracle at Delphi to ask for its advice and was told that he should “deface the currency”. Following the debacle in Sinope, Diogenes decided that the oracle meant that he should deface the political currency rather than actual coins. He traveled to Athens and made it his life’s goal to challenge established customs and values. He argued that instead of being troubled about the true nature of evil, people merely rely on customary interpretations. This distinction between nature (“physis“) and custom (“nomos“) is a favorite theme of ancient Greek philosophy, and one that Plato takes up in The Republic, in the legend of the Ring of Gyges. Diogenes arrived in Athens with a slave named Manes who abandoned him shortly thereafter. 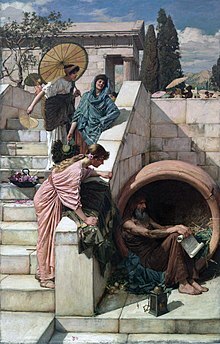 With characteristic humor, Diogenes dismissed his ill fortune by saying, “If Manes can live without Diogenes, why not Diogenes without Manes?” Diogenes would mock such a relation of extreme dependency. He found the figure of a master who could do nothing for himself contemptibly helpless. He was attracted by the ascetic teaching of Antisthenes, a student of Socrates. When Diogenes asked Antisthenes to mentor him, Antisthenes ignored him and reportedly “eventually beat him off with his staff”. Diogenes responds, “Strike, for you will find no wood hard enough to keep me away from you, so long as I think you’ve something to say.” Diogenes became Antisthenes’ pupil, despite the brutality with which he was initially received. Whether the two ever really met is still uncertain, but he surpassed his master in both reputation and the austerity of his life. He considered his avoidance of earthly pleasures a contrast to and commentary on contemporary Athenian behaviors. This attitude was grounded in a disdain for what he regarded as the folly, pretense, vanity, self-deception, and artificiality of human conduct. The stories told of Diogenes illustrate the logical consistency of his character. He inured himself to the weather by living in a clay wine jar belonging to the temple of Cybele. He destroyed the single wooden bowl he possessed on seeing a peasant boy drink from the hollow of his hands. He then exclaimed,” Fool that I am, to have been carrying superfluous baggage all this time!” It was contrary to Athenian customs to eat within the marketplace, and still he would eat, for, as he explained when rebuked, it was during the time he was in the marketplace that he felt hungry. He used to stroll about in full daylight with a lamp; when asked what he was doing, he would answer, “I am just looking for an honest man.” Diogenes looked for a human being but reputedly found nothing but rascals and scoundrels. When Plato gave Socrates’ definition of man as “featherless bipeds” and was much praised for the definition, Diogenes plucked a chickenand brought it into Plato’s Academy, saying, “Behold! I’ve brought you a man.” After this incident, “with broad flat nails” was added to Plato’s definition. According to a story which seems to have originated with Menippus of Gadara, Diogenes was captured by pirates while on voyage to Aegina and sold as a slave in Crete to aCorinthian named Xeniades. Being asked his trade, he replied that he knew no trade but that of governing men, and that he wished to be sold to a man who needed a master. In fact, this was a pun. In ancient Greek this would sound both as “Governing men” and “Teaching values to people”. Xeniades liked his spirit and hired Diogenes to tutor his children. As tutor to Xeniades’ two sons, it is said that he lived in Corinth for the rest of his life, which he devoted to preaching the doctrines of virtuous self-control. There are many stories about what actually happened to him after his time with Xeniades’ two sons. 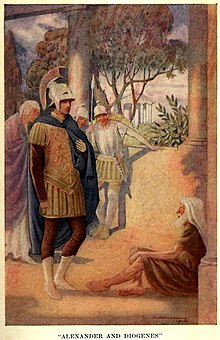 There are stories stating he was set free after he became “a cherished member of the household”, while one says he was set free almost immediately, and still another states that “he grew old and died at Xeniades’ house in Corinth.” He is even said to have lectured to large audiences at the Isthmian Games. There are conflicting accounts of Diogenes’ death. He is alleged variously to have held his breath; to have become ill from eating raw octopus; or to have suffered an infected dog bite. When asked how he wished to be buried, he left instructions to be thrown outside the city wall so wild animals could feast on his body. When asked if he minded this, he said, “Not at all, as long as you provide me with a stick to chase the creatures away!” When asked how he could use the stick since he would lack awareness, he replied “If I lack awareness, then why should I care what happens to me when I am dead?” At the end, Diogenes made fun of people’s excessive concern with the “proper” treatment of the dead. The Corinthians erected to his memory a pillar on which rested a dog of Parian marble. Along with Antisthenes and Crates of Thebes, Diogenes is considered one of the founders of Cynicism. The ideas of Diogenes, like those of most other Cynics, must be arrived at indirectly. No writings of Diogenes survived even though he is reported to have authored over ten books, a volume of letters and seven tragedies. Cynic ideas are inseparable from Cynic practice; therefore what we know about Diogenes is contained in anecdotes concerning his life and sayings attributed to him in a number of scattered classical sources. Diogenes maintained that all the artificial growths of society were incompatible with happiness and that morality implies a return to the simplicity of nature. So great was his austerity and simplicity that the Stoics would later claim him to be a wise man or “sophos”. In his words, “Humans have complicated every simple gift of the gods.” Although Socrates had previously identified himself as belonging to the world, rather than a city, Diogenes is credited with the first known use of the word “cosmopolitan“. When he was asked where he came from, he replied, “I am a citizen of the world (cosmopolites)”. This was a radical claim in a world where a man’s identity was intimately tied to his citizenship in a particular city state. An exile and an outcast, a man with no social identity, Diogenes made a mark on his contemporaries. 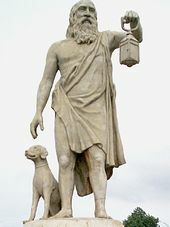 As noted, Diogenes’ association with dogs was memorialized by the Corinthians, who erected to his memory a pillar on which rested a dog of Parian marble. Diogenes is discussed in a 1983 book by German philosopher Peter Sloterdijk (English language publication in 1987). In his Critique of Cynical Reason, Diogenes is used as an example of Sloterdijk’s idea of the “kynical” — in which personal degradation is used for purposes of community comment or censure. Calling the practice of this tactic “kynismos”, Sloterdijk explains that the kynical actor actually embodies the message he is trying to convey. The goal here is typically a false regression that mocks authority — especially authority that the kynical actor considers corrupt, suspect or unworthy. There is another discussion of Diogenes and the Cynics in Michel Foucault‘s book Fearless Speech. Here Foucault discusses Diogenes’ antics in relation to the speaking of truth (parrhesia) in the ancient world. Foucault expands this reading in his last course at the Collège de France, The Courage of Truth. In this course Foucault tries to establish an alternative conception of militancy and revolution through a reading of Diogenes and Cynicism. Diogenes’ name has been applied to a behavioural disorder characterised by involuntary self-neglect and hoarding. The disorder afflicts the elderly and has no relation to Diogenes’ deliberate rejection of material comfort. Both in ancient and in modern times, Diogenes’ personality has appealed strongly to sculptors and to painters. Ancient busts exist in the museums of the Vatican, the Louvre, and the Capitol. The interview between Diogenes and Alexander is represented in an ancient marble bas-relief found in the Villa Albani. Among artists who have painted the famous encounter of Diogenes with Alexander, there are works by de Crayer, de Vos, Assereto,Langetti, Sevin, Sebastiano Ricci, Gandolfi, Johann Christian Thomas Wink (de), Abildgaard, Monsiau, Martin, and Daumier. The famous story of Diogenes searching for an “honest man” has been depicted by Jordaens, van Everdingen, van der Werff, Pannini, and Corinth. Others who have painted him with his famous lantern include de Ribera, Castiglione, Petrini, Gérôme, Bastien-Lepage, and Waterhouse. The scene in which Diogenes discards his cup has been painted by Poussin, Rosa, and Martin; and the story of Diogenes begging from a statue has been depicted by Restout. In Raphael‘s fresco The School of Athens, a lone reclining figure in the foreground represents Diogenes. Diogenes is referred to in Anton Chekhov‘s story “Ward No. 6”; William Blake‘s The Marriage of Heaven and Hell; François Rabelais‘Gargantua and Pantagruel; Goethe‘s poem Genialisch Treiben; as well as in the first sentence of Søren Kierkegaard‘s novelistic treatiseRepetition. 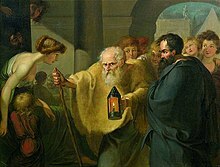 The story of Diogenes and the lamp is referenced by the character Foma Fomitch in Fyodor Dostoevsky‘s “The Friend of the Family” as well as “The Idiot”. In Cervantes‘ short story “The Man of Glass” (“El licenciado Vidriera“), part of the Novelas Ejemplarescollection, the (anti-)hero unaccountably begins to channel Diogenes in a string of tart chreiai once he becomes convinced that he is made of glass. Diogenes gives his own life and opinions in Christoph Martin Wieland‘s novel Socrates Mainomenos (1770; English translation Socrates Out of His Senses, 1771). Diogenes is the primary model for the philosopher Didactylos in Terry Pratchett‘s Small Gods. He is mimicked by a beggar-spy in Jacqueline Carey‘s Kushiel’s Scion and paid tribute to with a costume in a party by the main character in its sequel, Kushiel’s Justice. The character Lucy Snowe in Charlotte Brontë‘s novel Villette is given the nickname Diogenes. Diogenes also features in Part Four of Elizabeth Smart‘s By Grand Central Station I Sat Down and Wept. He is a figure in Seamus Heaney‘s The Haw Lantern. In Christopher Moore‘s Lamb: The Gospel According to Biff, Christ’s Childhood Pal, one of Jesus‘ apostles is a devotee of Diogenes, complete with his own pack of dogs which he refers to as his own disciples. His story opens the first chapter of Dolly Freed’s 1978 book Possum Living. The dog that Paul Dombey befriends in Charles Dickens‘ Dombey and Son is called Diogenes. 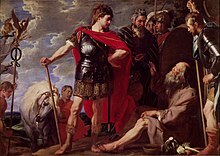 Alexander’s meeting with Diogenes is portrayed in Valerio Manfredi‘s (Alexander Trilogy) “The Ends of the Earth”. Diogenes was a character in the play and later movie A Funny Thing Happened on the Way to the Forum. Buster Keaton played the part in the movie while terminally ill.